Our summer fellowship program helps medical students learn to become physician-scientists. Read about one of our trainees who investigated an imaging tool for use in patients with a rare uterine cancer. The academic rigors of medical school are well known. Students face early mornings of back-to-back lectures on topics such as microbiology and histopathology, long afternoons in the laboratory, and nights spent poring over textbooks. The experience to which Ms. Enweasor refers is Memorial Sloan Kettering’s eight-week Medical Student Summer Fellowship Program and the mentoring she has received from her faculty sponsor, radiologist Barbara Raphael. The Medical Student Summer Fellowship Program, which began more than three decades ago, gives first- and second-year medical students the chance to conduct clinical or laboratory research in the area of their choice. As one of the 61 student selected for the fellowship in 2013, Ms. Enweasor chose a project investigating the role of fluorine-18 fluorodeoxyglucose PET combined with CT (a type of imaging, also known as FDG PET/CT, which is used to identify cancer in the body) in caring for patients with recurrent uterine leiomyosarcoma, a rare and aggressive tumor of the uterus. Ms. Enweasor’s role on the project, which is the largest retrospective study of its kind, has been to review medical records and help identify patients who might be more accurately assessed through the use of FDG PET/CT imaging. She presented the preliminary data for the project on August 15, at a special poster session for fellowship students. “We hypothesize that FDG PET/CT might have a higher sensitivity to detect recurrent disease compared to CT and could become a better tool for post-therapy surveillance of patients at risk for recurrence of high-grade uterine sarcomas,” Ms. Enweasor says. Other physicians participating in the ongoing study include medical oncologist Martee L. Hensley, Molecular Imaging and Therapy Service Chief Wolfgang Weber; and Body Imaging Service Chief Evis Sala. To supplement the research component of the fellowship, students attend weekly talks featuring leading physician-scientists at Memorial Sloan Kettering including, this past summer, Deputy Physician-in-Chief for Breast Cancer Programs Larry Norton and Memorial Sloan Kettering President Craig B. Thompson. “These lectures gave me an overview of what cancer research looks like now, and got me excited about where it’s going in the future,” Ms. Enweasor says. Other speakers address matters of everyday importance, such as how to follow institutional guidelines for involving patients in clinical studies, while special training sessions expose the students to the basics of pulling data from the medical record system for retrospective analysis. “They are learning how to set up a research study from start to finish as well as how to be responsible physician-scientists,” observes Dr. Raphael, who was herself a trainee at Memorial Sloan Kettering before joining the faculty in July 2012. Many of the students also have the opportunity to sit in on disease management team (DMT) meetings. DMT meetings bring together specialists in surgery, oncology, genetics, pathology, radiation therapy, and imaging, along with other experts who help to ensure that patients’ nonmedical needs are being met. Teams meet weekly to review cases and develop individualized treatment plans for specific patients. 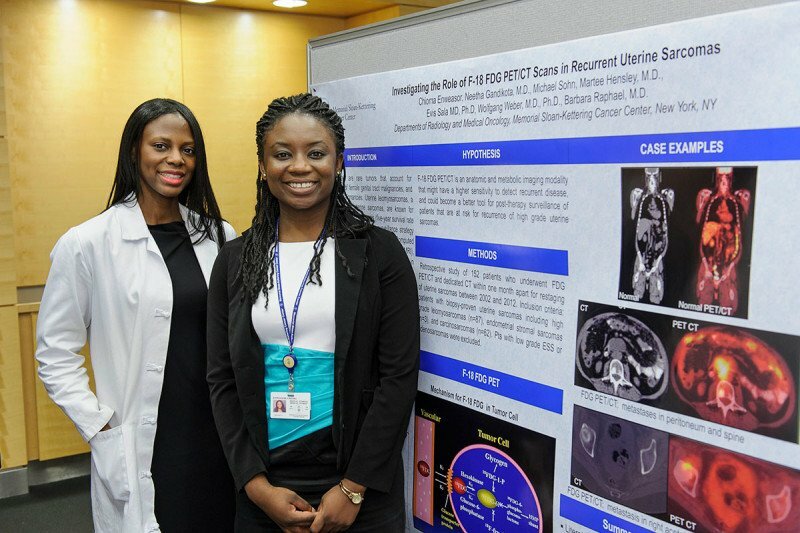 Ms. Enweasor’s participation in the Medical Student Summer Fellowship Program was supported through Memorial Sloan Kettering’s Office of Diversity Programs in Clinical Care, Research, and Training, which is committed to increasing the number of minority researchers and professionals in oncology. I have ovarion cancer and im also hepatitis c so they cant do surgering but they gonna try to do quemo .I want to know that even with hepatitis c ya can do surgering. (ovaries, tube).ect.ect.... and quimo ....please help me im only 40yr and I have 4"grandkids .I want to die. Maria, unfortunately we are unable to answer specific medical questions on our blog. If you would like to make an appointment with a Memorial Sloan-Kettering physician, please call our Physician Referral Service at 800-525-2225 or go to http://www.mskcc.org/cancer-care/appointment. They should be able to answer your question. Thanks for your comment. You may be interested learning more about our International Observership Program. For more information about the program, you can go to http://www.mskcc.org/cancer-care/healthcare-professionals/international… or send an email to intnlprg@mskcc.org. I am an EMT-B/ Medical Assistance. I have about 4 years experience working as a emt and 1 year experience as a medical Assistance, I want to work as a Emergency Room Tech. How can I do this? Tania, to find out about jobs at MSK, you can go to http://careers.mskcc.org/ and search on the jobs that interest you. Thank you for your comment. Dear Laura, to learn more about our programs for high school and college students, please visit https://www.mskcc.org/education-training/high-school-college. For more information about our Epidemiology & Biostatistics summer internship program, please visit https://www.mskcc.org/departments/epidemiology-biostatistics/student-in…. Thank you for reaching out to us. Before she went to medical school, Chioma Enweasor was our Health Corps Coordinator here at Luther Burbank High School in Sacramento. Today, I am delighted to see how her powerful mind is taking her on the path to heal others. We knew how wonderful she was back then. Today, there is no doubt! I am an osteopathic medical student looking for summer research opportunities. Does this program accept DO students? Dear Shruthi, this program is open to both MD and DO students who are based on the US. If you would like to learn more, you can go to https://www.mskcc.org/hcp-education-training/medical-students/summer-fe…. Thank you for your comment.